Deforestation has been a serious global problem for several decades. Illegal logging has been happening for decades; wildfires and other disasters take their toll as well. Enforcing laws can be a dangerous game and reforestation cannot keep up. Drones are changing the way we combat these losses. Many people think of deforestation as simply too many trees being logged in the Amazon jungle. After all, that is how many people started hearing about the problem of deforestation. For decades, scientists and environmentalists have warned about the consequences of losing the world’s rainforests. But for billions of people, the Amazon area is far away and thus, out of mind. But deforestation is not confined to Amazon rainforests. Many folks are unaware that there is also a rainforest in Alaska. Several of the world’s forests are being lost to illegal palm oil farms, sassafras for illegal drugs, wildfires both intentional and natural in origin, mining, and volcanic eruptions. Growing demand for wood, wood products and agricultural land also have their impact. Thankfully, a new technology shows promise as a powerful weapon in the fight against deforestation. That technology is unmanned flying drones – and the ways in which it can help save our planet are many and powerful. What Can Drones Do to Help? Drones are doing an amazing job with global reforestation efforts. And just as importantly, drones are making it easier to police the world’s forests for illegal activities, whether it be locating coca fields or exposing illegal palm oil farms in Malaysia. National Geographic cites that nearly 16,000 square miles of rain forest on Borneo alone have been cleared for palm oil farms since 1973. These farms create devastating results for the environment and local communities. 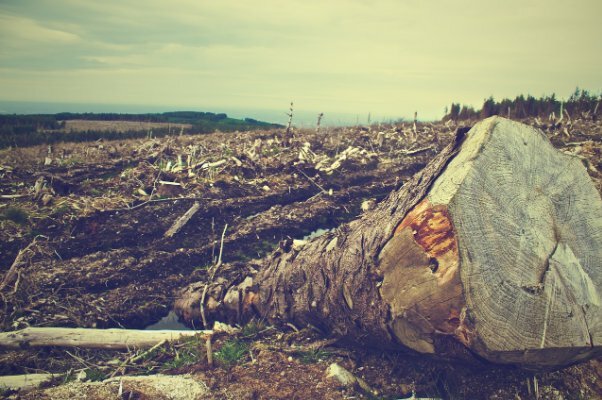 Aerial surveying efforts can track losses to determine the extent to which logging activities are in conformance, as well as determine the location and size of illegal activities. One of the advantages of using drones for policing efforts is their small size. It is much more difficult to shoot down a small drone flying high overhead than it is to shoot down a helicopter patrolling the same location. And since a drone is unmanned, there is no loss of human life involved. Fuel costs and scheduling problems are pretty much non-existent with drones. Bad weather, however, is still an issue. Since the loss of topsoil is an almost immediate result of deforestation, replanting trees needs to be done as soon as possible so that new roots can start holding the soil in place. Heavy and/or prolonged rains in deforested areas can end up causing mudslides, resulting in billions of dollars worth of damage and heavy loss of life, both human and animal. Traditional reforestation techniques still involve people trudging about with shovels and trucks laden with bags of new trees to plant. This can be an expensive, time-consuming and labor-intensive process, and usually the trees have to be grown for about a year before being planted. The time needed to reforest even a small area of several acres is considerable; so this admirable pursuit has little hope of overtaking the amount of deforestation that is constantly occurring. Drones offer a solution to this problem as well. Flying above deforested areas, drones can drop or launch seed pods at the ground with enough force to bury them in the soil. Sometimes called ‘seed dropping,’ this tree-planting technique can be up to 10 times faster than hand planting – and much cheaper. Even small drones are capable of out-planting the people needed to reforest acreage. With seed dropping, two drone operators can plant almost 100,000 trees per day, making it possible to plant almost a billion trees each year. BioCarbon Engineering is the company that made this happen, providing a new and feasible perspective on reforestation. What Else Are Drones Doing to Fight Deforestation? Drones are also planting trees in areas that are inaccessible by land, making reforestation by traditional means highly difficult or impossible. And it’s not just a matter of “bombing” some bare land with a bunch of seeds. DroneSeed, a U.S.-based company committed to reforestation efforts, develops a plan for each planting area that maximises successful planting and tree growth. Understanding the environmental conditions of the site is paramount to successfully replanting the area. Topographical maps are made, photographs are taken and other methods are performed before any planting can take place. Using this data, actual planting locations are determined so that each seed package has a much greater chance of survival. 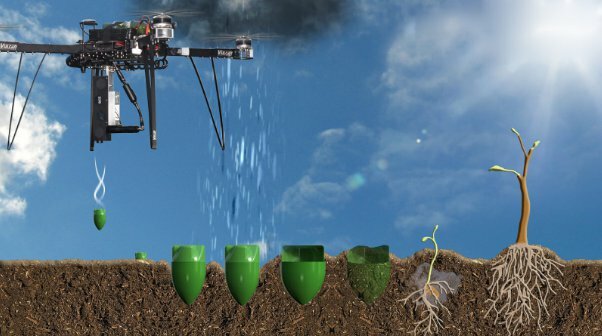 After planting, the location is monitored and growth is optimized with fertilizer, herbicide and water, all of which are also applied by the drones. In addition to gathering data needed for planting, drones are also collecting data on growth, canopy cover and other factors which allow the creation of 3D models of the actual reforested area. The flights that drones can take over a specific parcel of reforested land yields a huge amount of data that would take a team of people several weeks to collect. And with a 3D printer or box of parts, extra batteries, chargers and a generator, work can continue as long as the team holds out. So What is the Near-Term Focus? Look for continued efforts to reforest areas stricken by wildfires and areas slated for mining restoration, as well as those efforts to combat illegal deforestation activities. It is also conceivable that drones will be used to further assist law enforcement efforts at combating illegal activities, such as the aforementioned palm oil farms. Drone technology is advancing by leaps and bounds, but the areas of concern this year for reforestation activities will certainly be battery life and the inability to use drones in high winds and inclement weather.